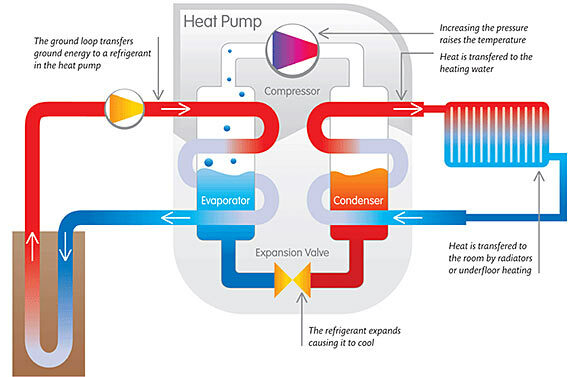 The principle behind heat pumps is based on the first law of thermodynamics, whereby “Energy may be transferred into a system by heating, compression, or addition of matter, and extracted from a system by cooling, expansion, or extraction of matter.” 1 This means that heat can be created from a colder source and vice-versa when energy external to the original system is applied. Ultimately heat can be extracted from anything that is above absolute zero (−273.15°C or −459.67°F). In this capacity heat pumps can operate as both heating or cooling devices by either transferring a temperature from one area to another, expanding/contracting a substance, or both. An air source heat pump uses the outside air to heat or cool a building. When used to heat a building this is achieved by transferring heat inside from the outside air, and when used to cool a building this is achieved by transferring heat from inside to the outside air. To achieve heat transfer in either direction, air source heat pumps use a system that includes a heat exchanger, a compressor and a means to transfer heat from one area to the other, e.g., pipes filled with a refrigerant. The heating process starts with a cold refrigerant that is moved outside where it becomes heated by a combination of outside air being blown by a fan onto refrigerant coils, and a compressor that further increases the temperature through compressing the refrigerant. The heated refrigerant is then moved indoors where it passes through another set of refrigerant coils (heating coils) where another fan extracts the heat from the coils by blowing air on it. The heated air can then be distributed about the building through air ducts. Lastly the refrigerant is passed through an expansion valve that cools it down to begin the cycle all over again. The cooling process is virtually the reverse of the heating process, whereby a reversing valve near the compressor changes the direction of the refrigerant flow. The efficiency of air source heat pumps is generally higher than traditional boilers and electric heating, which means that over the long term they will cover their investment. Air source heat pumps are driven by electricity, and systems exist that are powered by solar panels, making them both clean and energy efficient. Absorption heat pumps work similar to air source heat pumps but instead of using electricity to compress a refrigerant, they use heated water generated from solar boilers, geothermal resources or natural gas in combination with an absorption pump and a pressure pump. The absorption pump absorbs ammonia or lithium bromide into water. This mix is then pressurized by the pressure pump. The ammonia or lithium bromide is then boiled out of the water by the heat from the heated water creating heat that can be used inside. However, unlike air source heat pumps, absorption heat pumps are not reversible. The direct exchange system is the simplest, most efficient and also least expensive. It involves a heat pump that circulates a refrigerant through underground copper pipes, where heat is transferred from the ground to the refrigerant through the copper piping. Although this system is limited by the thermal conductivity of the ground, its lack of additional mechanisms, e.g., water pump and heat exchanger, make its overall energy efficiency very high. The closed loop system involves two sets of piping, one that contains water and anti-freeze and passes below the ground to absorb heat and transfer it through a heat exchanger to the second pipe that contains refrigerant and is in contact with the heat pump that distributes the heat throughout the building. This system also requires a water pump to move the water and anti-freeze below the ground. The name “closed loop” comes from the fact that the liquids in both piping systems remain contained, without being refreshed, i.e., they are continuously reused. 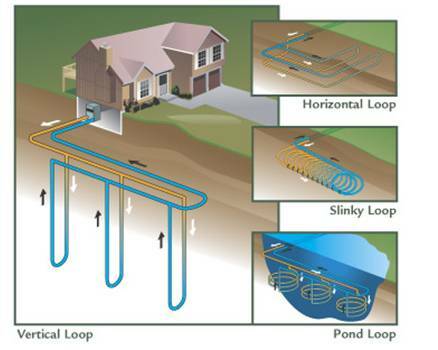 Closed loop variations include distributing the underground pipes either vertically, horizontally or under water. Determining which method is best depends on factors such as cost, availability of land, underground geology and proximity to water. Horizontal is cheaper than vertical, but requires more land, and wet environments are best for transferring heat. 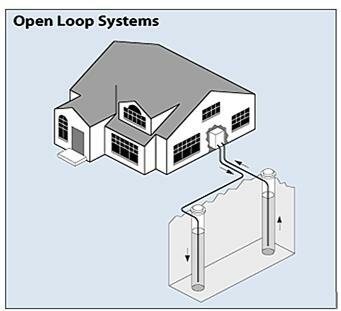 An open loop heat pump operates like a closed loop system in that it uses two piping loops with a heat exchanger. The difference is with the underground loop, that, instead of reusing the same liquid, accesses water from an underground source or pond. In this case water is continuously renewed throughout the loop. An open loop system is only practical where there is easy access to water. Issues with this type of system include pipe contamination from minerals in the water, and also the possibility that such a system may drain or contaminate natural aquifers or wells. However, if done properly a heat pump system will be one of the most efficient and effective heating systems available, with minimum yearly maintenance costs and a lifespan of between 25 and 200 years. Heat pump systems typically pay for themselves within 1 to 10 years (depending on the type of system), making them an extremely sound investment. EnergyGroove.net | Powered by Mantra & WordPress.